I hope everyone had a Happy Thanksgiving and was able to get their fill of turkey and all the trimmings. All I did was eat, and watch football – what better way to spend the holiday’s with family. Which brings me to one of those days, but with a happy ending. I fished with Norm Bayer and friends two Saturday’s ago, in the creeks of Smith Island (Where else can you hide from the ever-present wind). Norm was my very first G.Loomis rep. many, many years ago. The very first creek we stopped at yielded a few nice fat rockfish. This had me thinking it was going to be a great day in the creeks. Well, it wasn’t meant to be. 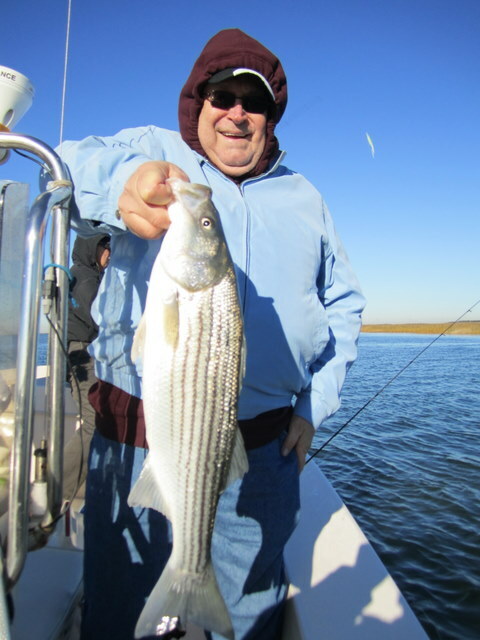 I had four hungry guys in the boat looking for their limit of Tangier rock and the stripers were playing hard to get. We fished creek after creek for around three hours with just eight or ten fish to show for our efforts. There was enough action to keep the guys trying, but just barely enough. As this was only a half-day trip, I decided to travel back across the sound and look for birds on our way home. Well, my feathered friends didn’t let me down, only they were much bigger than I anticipated. Pelicans! Lots and lots of pelicans were diving not far off Smith Island and as we approached the fish-finder lit-up! I told the guys to drop their plastic jigs and most everyone hooked-up instantly. Jim Haire had the hot hand out here in the sound, and between the four of them we quickly filled our two fish limit. That’s late fall fishing in a nutshell. The fish are tightly schooled and constantly on the move. It can be all or nothing, and you just have to keep moving and looking. Thanks guys for being patient. Monday a week ago I had the pleasure of fishing with Bucky Dennig, Bob and Skip. They had never cast artificials on light tackle before and I wanted to show them what it was all about. 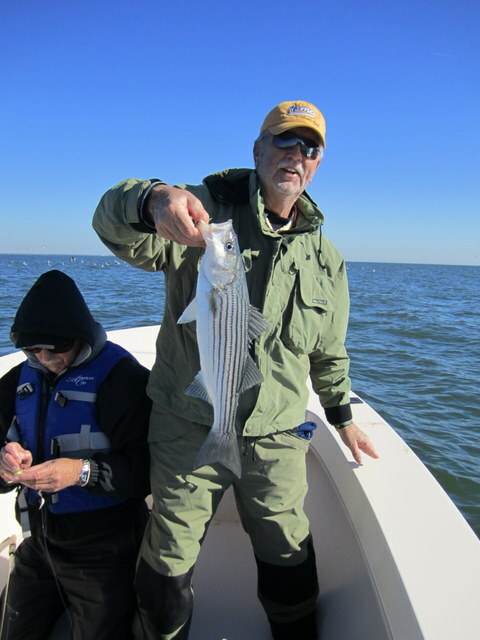 Unfortunately, this time of the year the fish school out in the sound and bay and much of the fishing is chasing birds or jigging up rockfish off the edges. The shallows, had been slow of late due to falling water temperatures, so we traveled to the main bay just west of Smith Island. The seas were higher than forecast but the guys were okay with it, so we just took our time as I scanned the horizon for birds. We found several groups of gulls right where they were supposed to be and the fish were jam-packed under the birds like I had hoped. I breathed a sigh of relief, as I pictured one of those 100 fish days for my newcomers to light tackle jigging. Was I in for a shock. Time-after-time we drifted through thickly packed marks of what were clearly rockfish with barely a tap. Several half-hearted tugs was all we were able to manage. Then it struck me. I noticed the absence of bait in the water and I realized that the fish must be feeding on krill. This small shrimp-like crustacean can be a nuisance this time of the year as the stripers become so keyed-in on gorging themselves with krill that they ignore conventional offerings. Today was one of those days. We tried small dropper flies in hopes of matching the bait to no avail. Accepting defeat – for today at least – I traveled to a few shallow-water stump fields where we ended the day catching some nice stripers casting shad-tailed jigs. The guys had fun and we again ended the day on a high note. I’ll solve this krill mystery yet.